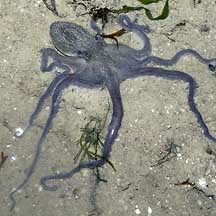 Octopuses are common on many of our shores. They are just hard to spot. They are among the most intelligent of invertebrates. They can bite. Don't touch them! Where seen? 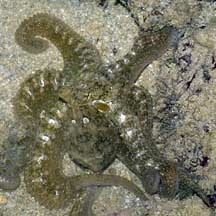 Most people are surprised to hear that octopuses are quite commonly encountered on many of our shores. Even the most 'beat up' looking shore eventually turns up a resident. 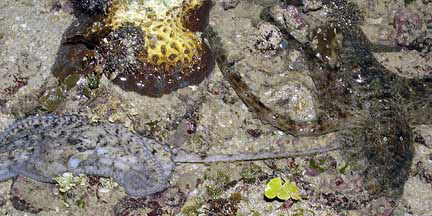 They are generally more common in areas with coral rubble, but may also be seen in seagrass areas. You need patience and some experience, however, to spot an octopus. 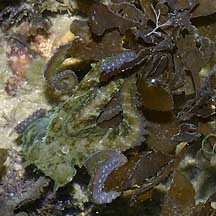 These marvellous masters of camouflage are shy and generally only active at night. During the day, they are often well hidden in some cosy den. 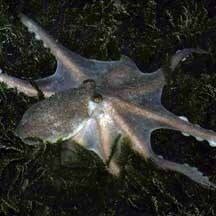 Some octopuses seen are as large as 1m across with their arms outstretched. Others are tiny, less than 10cm across. What are octopuses? Octopuses are molluscs (Phylum Mollusca) like snails, slugs and clams; and cephalopods (Class Cephalopoda) which include squids and cuttlefish. 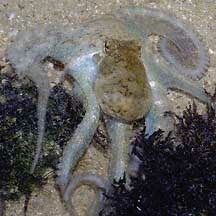 The correct plural term for octopus is octopuses and not octopi (more here). Awesome Octopus: The octopus is a hunter with many tricks. Among its formidable weapons is its brain! The octopus is in fact considered the smartest known invertebrate. It has a well-developed brain and excellent eyesight. 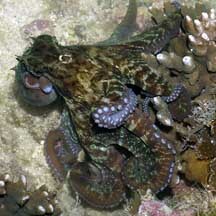 Studies show that the octopus can learn, not only by itself but also from one another! Armed and Dangerous: An octopus searches for prey mostly at night, spreading out its eight long arms to feel into crevices for crabs, prawns, snails, clams and other such morsels. 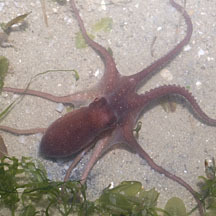 The highly flexible arms have strong suckers to grip objects so that the octopus can slowly 'creep' over the surface as it stealthily investigates all hiding places (octopuses use jet propulsion when they are in a bigger hurry, see below). The arms also have numerous receptors sensitive to taste and touch. Octopuses bite! Although octopuses have a hard beak and a radula (ribbon of teeth), they don't chew their food. Digestive juices are injected into the prey which soften the tissues. Some octopuses can drill a hole through a snail's shell to get at it. Others crush shells and crack crabs with their hard beaks. 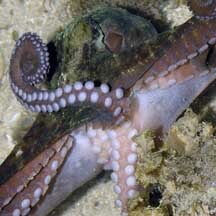 Not cuddly: Octopuses have a sharp, hard beak. Some can inject a toxin with their beaks. The tiny Blue-ringed octopus (Hapalochaena maculosa) is recorded for Singapore, but not commonly seen. Still, it is best to avoid touching any kind of octopus. How to stay safe: Wear covered footwear. Don't touch octopuses. The octopus has three hearts. Besides the usual heart, it has two additional hearts, each pumping extra blood through the gills. Its blood is blue due to concentrations of copper-based pigments that transport oxygen. 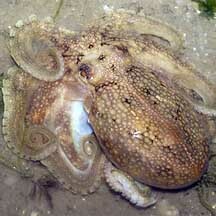 Shell-less but not helpless: Unlike most other molluscs, the octopus does not have a shell at all. This is actually an advantage as the octopus can then squeeze into all kinds of impossibly tight hiding places. The octopus, however, has many other ways to deal with danger. In the first place, an octopus is generally very difficult to spot. 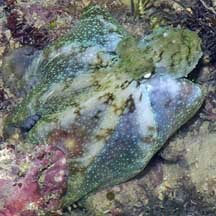 It can change its colours and even the texture of its skin to blend with its surroundings. And change these rapidly as it moves to a new location. When spotted, some octopuses make sudden drastic colour changes to confuse the predator. They then zoom off using jet-propulsion; squirting a jet of water out of a funnel to zoom off in the opposite direction. When particularly alarmed, an octopus may release a cloud of ink to disorient predators. The ink may contain substances that affect the senses of other sea creatures. In the clouded water, the octopus makes its getaway. 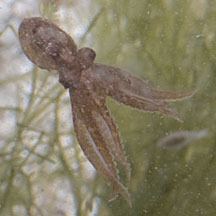 Octopus babies: Octopuses have separate genders. To mate, the male uses a special arm called a hectocotylus to insert a sperm packet into the female's body. While doing so, he usually keeps as far away from the female as possible, and he is usually pale, a sign of stress. The female uses the sperm to fertilise her eggs as she lays them. 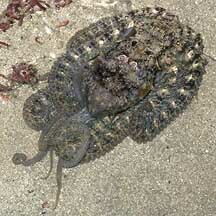 In most octopus species, the eggs are laid in capsules attached to hard surfaces. Here are some photos of cephalopod egg capsules. In bottom-dwelling octopuses, the female looks after her eggs; keeping them oxygenated, free of algae and bacteria, and defending them from predators. Some even carry their eggs with them. The female does not feed during this time and usually dies after the eggs hatch. 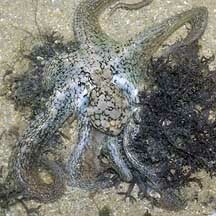 Most octopuses breed only once in their life, and many die after doing so. The eggs do not hatch into free-swimming larvae. Instead, miniature octopuses emerge. Some are rather well-developed and settle down soon after hatching. Others may drift with the plankton before settling down. Human uses: Octopuses are widely eaten in Asia. They are caught in many ways, including by lines, in pots or by trawling. 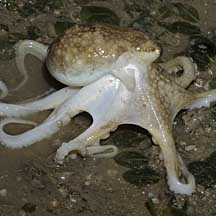 Status and threats: None of our octopuses are listed among the endangered animals of Singapore. However, like other creatures of the intertidal zone, they are affected by human activities such as reclamation and pollution. Trampling by careless visitors can also affect local populations. Using web as a net to trap prey. The arms can stretch out to great length! Underside is full of suckers. 'Walking' with its head above the ground. 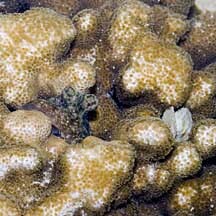 Well camouflaged on hard coral. These three photos are of the same animal ..
...with rapid colour and texture changes! one pale and the other dark. Octopuses are almost impossible to positively identify without dissection and examination of internal parts. On this website, they are grouped by external features for convenience of display. Octopus Tan, Leo W. H. & Ng, Peter K. L., 1988. A Guide to Seashore Life. The Singapore Science Centre, Singapore. 160 pp. The Cephalopod Page by Dr James B Wood on the Dalhousie University and the University of Texas Medical Branch website: everything you could possibly want to know about cephalopods. 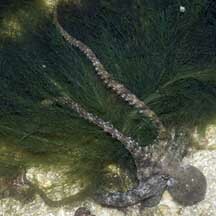 Lots of info, photos, articles and links to cephalopods. Lots of fabulous photos, a delightful and exhaustive FAQ, and lots of cool articles for the laymen, as well as lesson plans. How does an octopus change its skin colour? on the Mad Scientist website: Kimberley Sander explains how this can be done quickly by an octopus, while other animals take longer to do so. Norman, Mark and Amanda Reid. 2000. A Guide to Squid, Cuttlefish and Octopuses of Australasia The Gould League of Australia. 96pp. FREE photos of cephalopods. Make your own badge here.